Principal Cast : Denzel Washington, John Travolta, John Turturro, Luiz Guzman, James Gandolfini, Victor Godcaj, Ramon Rodriguez, Robert Vataj, Gbenga Akinnagbe, Michael Rispoli. Synopsis: When a highly intelligent man takes a train carriage full of hostages and demands cash, the city of New York must bend to his wishes. Flawed signalman Walter Garber is the madman’s only contact on the outside world, and using only his voice must try and contain the situation as best he can. But time is running out, as the clock on the cash demand is ticking. What we think : Surprisingly low-key thriller from the normally ebullient Tony Scott, a remake of the 70’s film that probably wasn’t required, but true to Hollywood form in mining stuff that’s not worth remaking, they remade it anyway. Talky, surprisingly tense, and filled with as much testosterone as Tony Scott can muster, Pelham 123 is actually not a bad film. Two things you need to know before continuing with this review: 1, I’ve not yet seen the original film on which this remake is based, and 2, I haven’t enjoyed a single one of Tony Scott’s films since Enemy Of The State. Which makes my following statement surprising: this film is a return to form for a director I feel has become too entranced with his own visual cleverness. Since I haven’t seen the original version of Pelham 123, you’ll be pleased to know that my thoughts on this film will be untainted by previously held opinions or past thoughts. So man up and take this train ride with me. A little time to reflect. 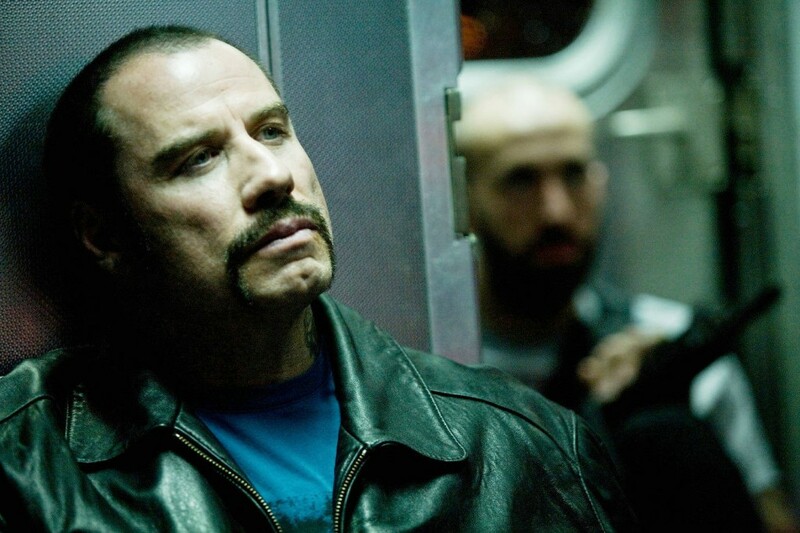 When a New York City subway train is taken hostage by a man known only as Ryder (Travolta), he holds the city to ransom for millions of dollars. Communicating with transit officer Walter Garber (Washington) via the intercom, Ryder trades verbal sparring with violent bursts of rage, part of his ulterior motive to steal even more money by creating a “terrorist” incident. As time ticks by for the Mayor (James Gandolfini phoning it in…) to arrange payment of Ryder’s demands, Garber comes under scrutiny himself from the authorities, as he is currently under investigation for taking a bribe: a fact Ryder learns and uses to drive a wedge into the relationship between Gerber and his superiors. Lead Police Emergency Agent Lt Camonetti (John Turturro) facilitates the release of the various hostages, or at least tries to, since Ryder always seems one step ahead. And when Ryder instructs Gerber to deliver the money in person, the inevitable confrontation and showdown ensues, from which only one of them will escape alive. Don’t panic, I have a gun – that’ll solve ALL our problems!!! 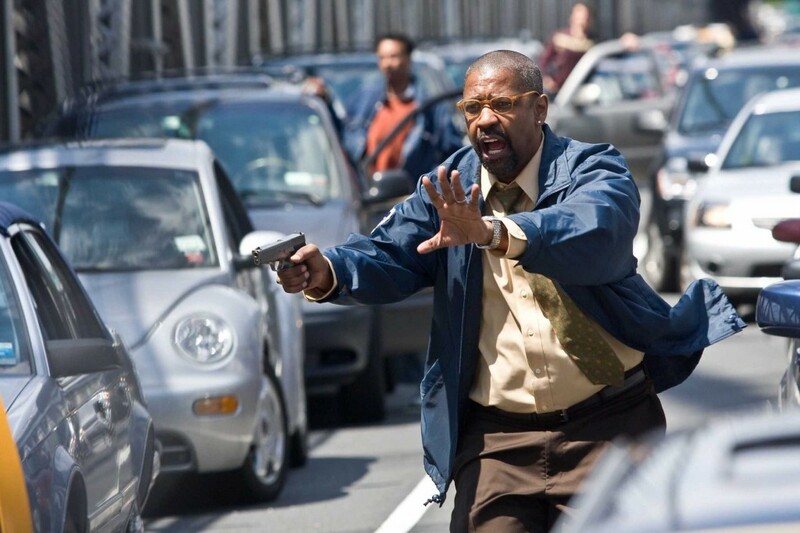 The Taking Of Pelham 123 remains, perhaps inexplicably, one of Hollywood’s favourite stories, particularly about New York, where the story is set. The original novel has been filmed no less than three times now, with both theatrical versions and a TV movie starring James Edward Olmos replaying the well-worn story. Hostage films are nothing new, and in this regard Pelham 123 offers nothing new to the genre, since it’s pretty much a Swordfish/Money Train/The Fugitive hodgepodge of well-worn cliches. Travolta produces the same character he did in From Paris With Love: a man with seemingly nothing to lose and a very short fuse, as Ryder. Ryder isn’t an idiot, and there’s just enough glint-in-the-eye from Travolta to indicate something deeper to the character, hidden beneath the surface. Washington is (not unexpectedly) rock solid in the Gerber role, both alternately befuddled and then appalled at what Ryder is doing on one of his trains. Neither actor is really stretched in this film, as each character seems custom built to suit their acting styles. Watching these two pros go at it in such a joy you can forgive a little complacency with the characters. The narrative, which has a Bad Guy “holding a city hostage”, is also well worn, but both the script and Tony Scott’s direction infuse it with an urgency that’s hard to overlook. I have a gun too, plus the added bonus of a walkie-talkie! Speaking of Tony Scott’s direction, with Pelham 123 I did not get a heachache. With most of his recent directorial output, I’ve often been left with a pounding migraine from watching the hyperkinetic visuals and jarring, post-modern art-house style: Domino, Man On Fire, even Deja Vu have all left me feeling like I’ve been brain-raped by disco lighting. The editorial style, jump-cuts and all, as well as the “uniquely” overdone visual style of the image makes my skin crawl with frustration – with Pelham 123, much of that jarring visual pyrotechnical nonsense is left over the opening credits, before we get into the film proper. The majority of the film is actually pretty darn watchable, at least in terms of its visual style. Here, Scott’s camerawork could be described most accurately as “sweeping”, with long dolly/tracking/crane shots that swoop in and around on our characters from every possible angle. But the annoying, colour corrected out-of-focus flashfire editing and visuals Scott’s become known for recently are refreshingly absent. Show me the money, man! This film isn’t a gangbuster action extravaganza, although it does have a fair degree of New York Street-based action in it – the ransom money is raced from Brooklyn to downtown Manhattan via a police convoy that has to navigate the various hazards of a major city. 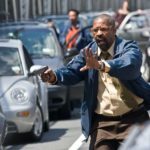 Don’t expect massive explosions – the trailer makes Pelham look like a Michael Bay epic, but it isn’t. Ostensibly, Pelham is a character driven film, albeit sieved through Tony Scott’s overly testosterone -driven visual style, which makes its reliance on Washington and Travolta to deliver the performance level a key ingredient to the success of the story. While the film doesn’t scale the lofty heights of other films in this genre, it’s a professional, well made film that doesn’t outstay its welcome. A worthwhile watch, although perhaps not as memorable as it could have been. © 2010 – 2014, Rodney Twelftree. All rights reserved. I thought it was passable entertainment but not much more. Definitely too much Tony Scott visual excess as usual and the characters are mostly one-note. Chalk up another one who doesn't like Tony Scott's visual style.